What are the ten most important minutes in a church service? Check out what the research shows and why your church greeters cannot go off duty. Note: If the video isn’t playing, please email me. I’m trying to verify for all platforms. I have learned that Internet Explorer 8 will not run this video. Please consider upgrading your browser to a more recent version. Rev. Susan and I talk about her experience of visiting a church with her family of 6. See how this failed to play out. What are some of the phrases you like to use to help get a conversation started with your first time visitor? 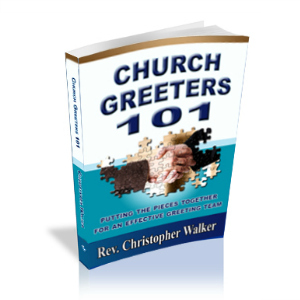 For more greeter training, consider getting your copy of Church Greeter Training DVD set. They are recorded webinars I have given. We have pew pads we sign and pass down for all to sign. At Guest Meeting on this past Sunday I asked everyone to look over the names and if someone they do not know, (or they see they have marked visitor) please go out of your way after the service to introduce yourself to them. Also our Pastor every Sunday welcomes and encourages visitors and everyone to sign and fill out the pads. Should not take for granted everyone knows to fill out pads. I’m not a big fan of pew pads, but that is a personal choice. I’ve not yet visited a church where that was successful in helping members talk to the visitor. I’ve actually experienced the reverse – people know I’m visiting, but choose not to talk with me. You’ve identified the real issue – recognizing a visitor and personally greeting them. I’ll need to make a video specifically on that one. Thanks for dropping by. I look forward to more comments from you on future videos. Thank you for suggesting the greeters came back after service. Great idea! I also purchased your book and just got it yesterday….looking forward to implementation. I just took over the lead position and it needs a major overhaul….Thank you again. Your welcome. Inviting your greeters to “come back on duty” when the service is over is one small but siginificant change to take your friendliness up a notch. As a buyer of my book, if you want a free coaching hour, simply email me and we’ll set it up. It’s a bonus that I offer. Never heard of the term “Passing the Peace” before. I do like some of the ideas presented here and will be looking at some of your other videos for ideas. I am taking the leadership role in our church regarding ushers, greeters, and hospitality team so could use all the ideas that you have. Thank you for doing this great ministry. I have the role of overseeing greeting/welcoming in our Church and have been encouraged by your videos & information. We have had some of the same issues & I’ve realized that it is very crucial to have the people with the appropriate giftings to serve in these areas. Thanks for asking. At this moment, that video is not availble on YouTube. It is available here. At some point, I plan to have it on a DVD. You are welcome. I’m glad you find these videos encouraging. If you have secured a copy of Church Greeeters 101, I’d love to offer your group an hour of follow up conversation specific to your church. I think that this video should not only be shown to the greeter team, but to the whole congregation. It’s everyone’s job to be a greeter. People need to be made aware of their responsibility as a member of the church and the body of Christ. My Great Grandson, age 12, lives with me. He opens the front door when folks come in and says “Good Morning. Welcome.” I am in the Narthex and say, “Hello, it is good to see you this morning,” and ask them to sign in, so we can contact them later. We usually recognize if the person is a new visitor. We live in a tourist town. Sometimes I say, “Are you from around here?” And they will say, “We are passing through on vacation,” or “We live here,” and the conversation goes from there. After the service, I stand at the door and say, “Have a good week,” or “We hope to see you soon.” Last Sunday a lady with a grown challenged child visited. His name was Matthew, and he had walked out of the church holding the Bible from the pew. So my Grandson offered to take the Bible back into the church for them. So all kinds of things come up. Just being helpful in any situation. We have had a gentleman with a back pack come in the front door looking for food. So you take him back to the kitchen and fill up his back pack, and off he went, riding his bicycle to Mobile. So you never know. I’ve enjoyed your videos and suggestions. Thank you. I agree! When I first went to the church we are now members of there was no way to know where to go, no body was talking to us, they all had their own “cliques”. I think we should scan and look for others to talk to and tell them we hope you come back! Thanks! Our “greeting time” during the early section of our service is when we do the hugging and ask all visitors to remain sitting, so they can be identified. Is that a good idea? I’ve heard that it is not a good thing to identify visitors from the pulpit. Getting our greeters to stay at their “post” during the service will be challenging…. When announcing Pass the Peace, our Pastor challenges everyone to greet someone they do not know. That doesn’t single out visitors but encourage everyone to seek some one they don’t usually speak to. Its not a time to hug your friends and family. Thank you sir for the video.